Should The Earth Be Cooling? | Fresh Air. The Scent of Pine. Indeed all climate models strive to identify the impact of natural mechanisms as compared to anthropogenic, or man-made, ones. The general conclusion has been that models of strictly natural influences do a pretty good job at reproducing real world, pre-industrial climate conditions but that the influence of mankind must be incorporated in order to reproduce the climate conditions of the industrial era. But at what point does the human component overwhelm its natural counterparts, when Mother Nature says we should be going in one direction while reality is going the opposite? While it’s impossible to know exactly what the climate conditions would be in the absence of mankind, we should be able to get a pretty good sense of at least whether or not the global climate would be warming or cooling. The simplest method to make this determination is by examining the trends of a few major natural mechanisms that influence the climate, namely solar irradiance, the El Niño Southern Oscillation (ENSO), and the Pacific Decadal Oscillation (PDO). Shifts in solar irradiance generally follow the Sun’s roughly 11-year sunspot cycle, but the magnitude of these cyclic changes is quite small. However, longer term, multi-decadal trends of rising or declining solar activity can have notable climatic impacts here on Earth. Longer periods of high solar activity or dormancy are often associated with the Medieval Warm Period (MWP) and the Little Ice Age (LIA) respectively. ENSO and PDO both refer to oceanic and atmospheric patterns in the Pacific Ocean, but they differ from one another. ENSO focuses on conditions near the equator. These conditions alternate between warmer (El Niño) and colder (La Niña) phases, with individual phases lasting from a few months to a year. Each phase can have a noticeable impact on global temperatures, with El Niño conditions driving temperatures higher and La Niña having the opposite effect. A particularly strong El Niño in 1998 is credited with pushing global temperatures to some of their highest levels on record. Similar to its equatorial cousin, the northern Pacific PDO alternates between warm and cold phases with a warm PDO encouraging warmer temperatures and a cold PDO the opposite. While its phases are less predictable than ENSO they can last much longer, up to multiple decades. So what has been going on with these three significant and natural climate drivers, particularly when compared to the warming influence of human industrial carbon dioxide (CO2)? NOAA’s National Climatic Data Center (NCDC) states, “The average value of a meteorological element over 30 years is defined as a climatological normal,” so let’s examine the current 30-year history of each of these natural mechanisms and their respective influences on the global climate. 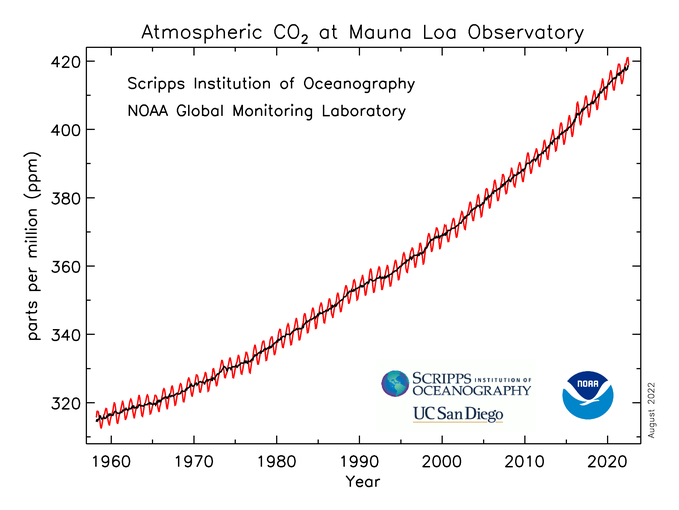 Figure 1 below depicts the 30-year trend from 1979 to the present of solar irradiance, ENSO, PDO, and atmospheric carbon dioxide. Each trend has been normalized in order to facilitate comparisons on equivalent scales. 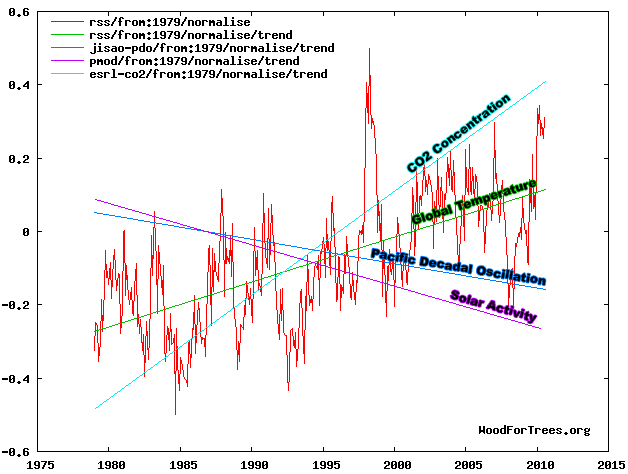 Each graph also includes the general warming or cooling influence of the trended data on Earth’s climate. Lastly, the normalized trend of global temperatures over the last 30 years is included. Based on the combination of decreased solar activity, a steady ENSO and a declining PDO over the last 30 years, we would expect to be experiencing a cooling climate. However, despite this opposition from multiple natural factors, global temperatures have risen throughout this time period as the concentration of atmospheric CO2 has escalated. Nature indicates the planet should be cooling. The reality has been just the opposite. What Do Climate Models Say? But do the climate models concur with this divergence? Figure 2 is an excerpt from the IPCC’s 4th Assessment in 2007. Depicted is the output of three climate models. Each model was run reflecting just natural climate influences and also with the inclusion of anthropogenic influences. The different model runs are depicted in color with those reflecting natural+human factors shown in bold. Actual conditions based on direct measurements and proxies are reflected in the background gray range. Examining the model outputs, as the world enters the industrial age, the models begin to show a split between the results from purely natural influences and those from natural+human factors. However, while the overall trends begin to diverge, the shorter term fluctuations remain in agreement. As the natural result warms, the natural+human result warms. As the natural result cools, the natural+human result cools. Over the section of the model runs depicting the last 30 years or so, the two model run types diverge completely. While the natural results show a distinct cooling trend in line with the actual observations of solar irradiance, ENSO, and PDO, the results from the natural+human runs show a marked warming trend. This divergence is highlighted in the figure. Looking at both the actual observations of historically significant climate forcings including solar irradiance, ENSO and PDO and the results from model runs depicting solely natural climate influences, we would expect our planet to be notably cooling. However, examining climate models including both natural and human influences, we would expect a continued warming trend over the last 30 years. Which is exactly what’s been happening.